Knapton, Richard W. and Tyler Hoar. "Finch". The Canadian Encyclopedia, 31 July 2018, Historica Canada. 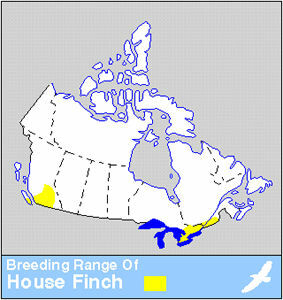 https://www.thecanadianencyclopedia.ca/en/article/finch. Accessed 22 April 2019. Finch is a common name for one of the larger bird families, Fringillidae, which occurs worldwide (introduced in Australia). It includes some GROSBEAKS, crossbills, Hawaiian honey creepers, redpolls, siskins and birds specifically named finches. A male Goldfinch (Carduelis tristis) perched in a cedar tree in Waterloo, Ontario. 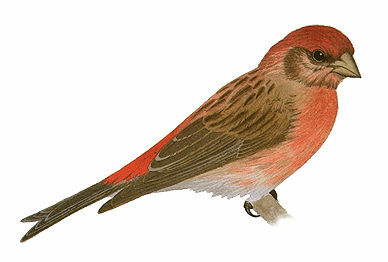 The adult male purple finch is actually red in colour (Macmillan Illustrated Animal Encyclopedia). Sound of the purple finch (press the Sound button) courtesy Monty Brigham, Bird Sounds of Canada. Finch is a common name for one of the larger bird families, Fringillidae, which occurs worldwide (introduced in Australia). 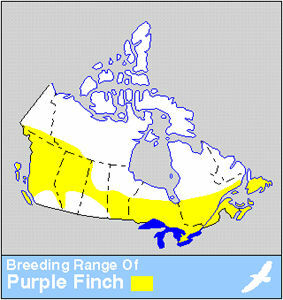 It includes some GROSBEAKS, crossbills, Hawaiian honey creepers, redpolls, siskins and birds specifically named finches. In Canada, about 16 species are known, of which 12 are known to regularly breed. 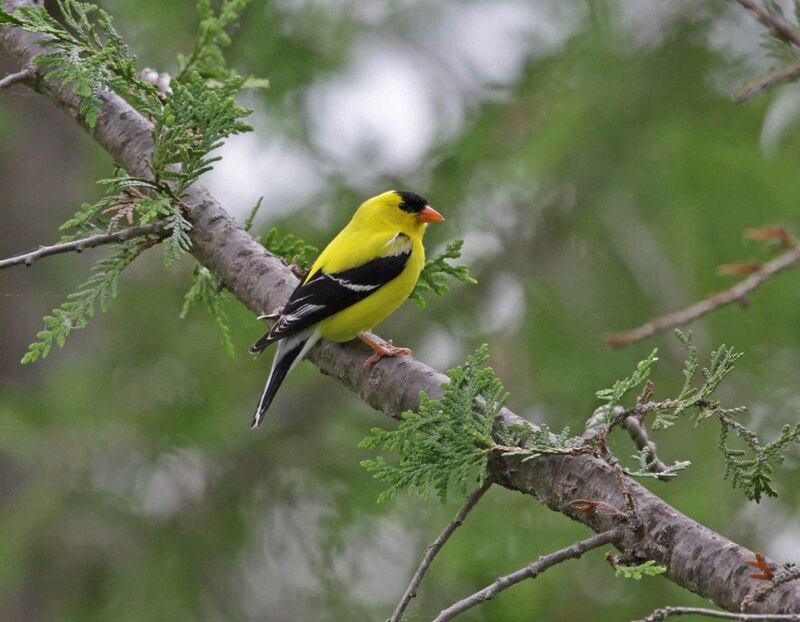 Finches range in length from smaller birds like redpolls (Acanthis hornemanni, A. flammea), pine siskin (Spinus pinus) and American goldfinch (S. tristis), that are as small as 11 cm, to larger ones such as the pine grosbeak (Pinicola enucleator), that are up to 25 cm in length. Although a diverse group, all members of the family have a stout, conical bill with a cutting edge angling sharply near its base. This makes it ideal for crushing seeds, the principal food of most finches; insects are also eaten. Bill dimensions vary considerably: grosbeaks have large, deep bills; goldfinches and siskins have relatively slender bills; the mandibles of crossbills overlap. Both plumage and song show tremendous variability. Males have bright and often strikingly patterned plumages, and most species have elaborate, tuneful songs. In northern Canada, some species raise one brood annually. As the summer is longer in southern Canada, most species attempt to raise 2 broods. In southern Canada, a few species of finch are resident, eg, house finches (Carpodacus mexicanus). Some species such as the grey-crowned rosy finch (Leucosticte tephrocotis) perform altitudinal MIGRATIONS and nest at the summit of mountains in Alberta, British Columbia and Yukon, but winter in the lowlands and foothills of western Canada. Southern Canada is a wintering area for some species nesting in northern Canada, such as redpolls, crossbills (Loxia curvirostra and L. leucoptera) and pine grosbeaks, but numbers vary considerably from year to year, depending on food availability farther north. Only a very few hardy species can survive winters in northern Canada; for example, at Churchill, Manitoba, only hoary redpolls attempt to overwinter, and even they are not found some winters. American GoldfinchHinterland Who's Who profile of the American Goldfinch.